Applications for freshman admissions for Fall 2018 saw a significant increase of 5.3 percent and resulted in an accomplished incoming freshman class of 1,634 students, the largest in University history. Belmont also continues to be among the top destinations for transfer students as 494 transfers, also a record, joined the campus this fall. The University’s graduate schools, which offer more than 25 master’s degrees and five doctoral programs, attracted 658 new students for 2018-19 new academic year. This year’s incoming freshman class hails from 48 states and represents nine foreign countries, with 74 percent of the class originating from outside of Tennessee. As a group, Belmont’s Class of 2022 scored an average of 27 on the ACT and held an average high school GPA of 3.7. The new students made their presence known throughout Nashville Tuesday afternoon as more than 2,100 freshmen and transfers participated in the annual SERVE event, which allows students to engage in community service at nonprofit sites around the city. 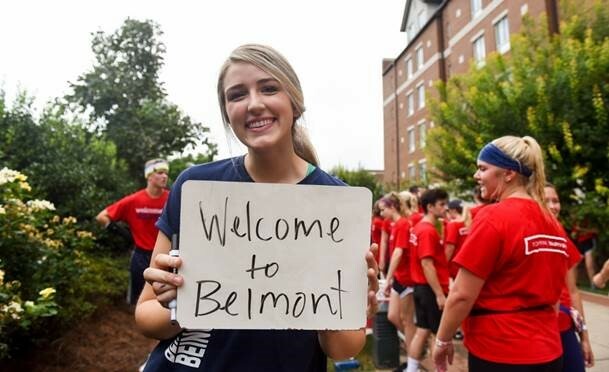 Belmont’s student body currently consists of 6,730 undergraduate students and 1,588 pursuing graduate/professional paths.